Making the decision to upgrade your floor covering to natural, healthier, beautiful hardwoods is one of the best ways to increase your home's value. Hardwood flooring in Dacula, GA is prevalent now more than ever, and nothing should stop you from getting the floors your family desires. At Flooring Service Group we focus on all of the advantages of hardwood floors over other types of floor coverings. From better breathing to easier cleanup, the added value of natural and recyclable hardwoods has a plethora of benefits for your home. One aspect of hardwoods that makes them superior to carpets or laminate is the ability to withstand high traffic areas. You can't tell the difference between low traffic and high traffic areas on hardwoods like you can with linoleum and carpet. It just doesn't get worn out. Go with hardwoods, you won't regret it. You read the title above and thought, "How are hardwoods healthier than carpet?" Let's get this out of the way-carpets feel fantastic?when they're new. That's pretty much the only advantage of carpets over hardwoods. While carpets are softer, they can keep some pretty nasty things in their fibers. Things such as pet dander, stains and bacteria can be found in the majority of carpets. Aside from harsh chemicals-which you want to keep away from your family and pets anyway-anything on a hardwood floor can be cleaned up and nearly germ-free. Oddly enough, pretty much the only way to keep you floors from harboring dust mites, seasonal pollens, dirt and grime is harsh chemicals. Let you family breathe easier by replacing your floors with hardwoods and reduce the cycle of indoor allergies. So you've made the decision to go with hardwood flooring, but you don't have a clue about installation, costs, the entire process or cleanup. Luckily, Flooring Service Group is here to help you learn everything there is to know about hardwoods and the best method of choosing color, species and design layout. The team of Dacula hardwood flooring design experts will work with you through every facet of the project, from initial consultation and preparation to install and final cleanup. 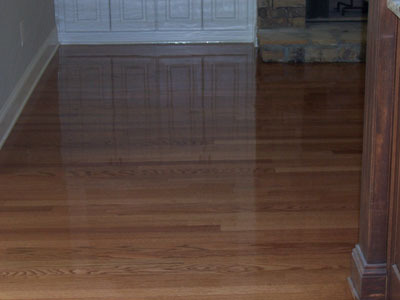 We have been serving Dacula and the surrounding area for nearly a decade, with honest and reliable wood flooring. Simon and his crew were very professional and did great work. They went above and beyond in refinishing my "pre-finished" hardwood maple floor. They worked quick and there was little to no dust. The result looks better than the day I installed it. Simon also went out of his way to order me custom maple transition threshold pieces where the wood met my tiled flooring. I would recommend and use his services again in the future. This workers were very punctual, they finished the job on time and were very reasonable. My wood floors look better after being refinished than they did when they were first installed. The owner was also very helpful in guiding me in selecting a stain, since it was my first time with this kind of project. I would not hesitate to use the company again with confidence in knowing the job would be done with my 100% satisfaction. Beautiful job! We were provided 6 quotes broken out by area with extreme detail. The quotes were provided the same day as the onsite review. The job was done in great time and with precision. The wood flooring and refinishing of existing match exactly and look wonderful. We were provided a number of test samples for the finish and the Jacobean throughout the house is perfect. Working in the design industry I have worked with hundreds of contractors and would recommend using hardwoodionas.com for any flooring needs!